A baseline inbounds play under your basket creates a great scoring opportunity. Watch how the Mavericks execute for the easy bucket. Sweet Sixteen action gets underway tonight. Hope you filled out your NCAA brackets in pencil. With teams like Vanderbilt, Villanova, Georgetown and No.1 seeded Kansas out of the running, it seems there have been more upsets than ever before. This is truly March madness. All collegiate players dream of the chance to compete in the electrifying NCAA Tournament. But before getting there these kids have to battle through intense regular season schedules followed by postseason conference tournaments. As many have argued, these end-of-year tournaments might be hurting some of the higher seeds. Tournament play wears them out before the real show gets underway and causes some bubble teams to lose bids as well. Years ago there weren’t post season tournaments in most conferences, but now they are requisite. For teams that normally don’t have a shot at they NCAA Tournament, they offer valuable opportunities. Not only are they moneymakers, but they also offer different regions a chance to recreate the excitement of the NCAA Tournament and are as close as most teams will ever come to the real thing. For some lucky underdogs with mediocre or even losing records, winning their conference tournament winds up being their golden ticket to the NCAA Tournament. The automatic bid even benefits some teams in small conferences that have impressive regular season records and successfully capture their postseason tourney titles, but would never get a bid otherwise because the NCAA knows they don’t play tough schedules. On the other hand kids who play through a whole season in major conferences like the Big East, Big Ten, Big 12, Pac 10, ACC and SEC are beat up by the time they enter the NCAA Tournament. They go up against difficult rivals all season long and then have to get through their demanding postseason tournaments. Four or five days later, a one or two seed may have to go up against a lesser known but nonetheless challenging opponent in the NCAA Tournament. Oftentimes the stronger teams from tough conferences are not mentally ready to play at the tops of their games at this point because so much has been taken out of them in postseason tournament play. Teams coming out of smaller, less competitive conferences are fresher and since any NCAA Tournament game is the biggest game of their lives, they are ready to play. They get a chance to knock off Goliath – so a matchup in the NCAA Tourney is their equivalent of a Super Bowl or the World Series and they are amped for the opportunity to topple a top team. Also an upset in a smaller conference tournament can ultimately prevent a team that’s on the cusp in a big, competitive conference from getting in due to the auto-bid. With the fourth best overall record in the ACC, Virginia Tech is an example of a team that arguably should have been in the NCAA. But as a result of getting knocked out of the ACC Tournament by last place Miami in conjunction with an upset in the Conference USA Tournament, there was no room for them this year. University of Houston finished seventh in the regular season, but upset number one UTEP in the Conference USA Championship game to make the NCAA for the first time in nearly two decades thanks to the automatic bid. Because UTEP dominated the regular season they earned a bid anyway. So two teams from the small Conference USA got in, whereas normally only one team would make it to the NCAA Tournament based on its size. While it’s always a thrill to see an unlikely hero have his moment in the sun, in the end the postseason conference tournaments can really hurt deserving teams from big conferences – whether they forfeit their bids to one hit wonders from smaller conferences or come up short in the NCAA Tournament itself. 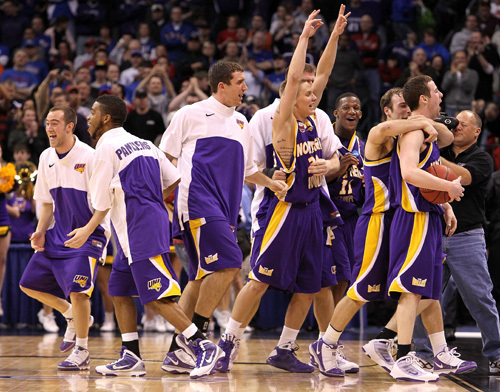 Do you think postseason conference tournaments should be eliminated? The Nets beat Sacramento to bank their eighth win of the season. They must take out two more teams in order to surpass the worst 82-game record in NBA history, set by the 1972-73 Philadelphia 76ers. With eleven games remaining in the regular season, who will they get these wins against? You can view the upcoming Nets schedule here. Two guys who have been sorely missed by their teams and fans are back in action this week and will face off tonight in New Orleans. Chris Paul returned to the Hornets’ starting lineup after being sidelined with a left knee injury for 25 games. And upon release from his contract with the Wizards, Zydrunas Ilgauskas agreed to return to the Cavaliers for the remainder of the season and is expected to make his return debut against Chris and the Hornets tonight. A fixture in Cleveland for over a decade, Zydrunas has battled through foot injuries to become the Cavaliers’ all-time leader in games played, rebounds and blocked shots. Among the most popular players in the franchise’s history, Z is a role player who has been integral to the Cavs’ success and remains a valuable asset to his team. He’s a skilled big man, a solid passer and the rare center who can reliably hit outside jump shots. With Shaq back, the addition of Z makes the Cavs an even deeper, better team. Chris Paul is the heart and soul of the Hornets. He’s an amazing point guard, quite possibly the best of his generation. Though rookies Collison and Thornton stepped up their games in Chris’s absence and did a terrific job holding down the fort, the Hornets only pulled off eight wins without Chris, slipping out of playoff contention. No doubt his teammates were relieved and excited to have him back on the court Monday to take on the Mavs. Chris appeared a little rusty in the first half of the game, but he hit some key shots down the stretch and the Hornets wound up winning the game 115-99. The Hornets have been playing well the last few games and they just beat the second team in the West by a significant margin. With Chris back in the lineup they’re looking like a playoff caliber team once again, though unfortunately not in time to nab a position in the postseason series this year. However, a strong finish will help build the young players’ confidence as they look to next season. The Hornets were without Chris Paul in their previous matchup against the Cavs, who wound up with the win. With Chris back in the mix, the Hornets are certainly capable of beating Cleveland, who lost their last three road games against the Hornets. But tonight New Orleans will be fighting an uphill battle because the Cavs are playing strong ball and LeBron appears to be reenergized as they look to lock up first place in the league overall. Fifth in the East behind Atlanta, all engines have been firing for the Milwaukee Bucks since the All-Star break and their acquisition of guard John Salmons from Chicago. Back in December the Bucks dug themselves into a deep hole and by mid-January they had dropped to tenth behind New York and Chicago. But they’ve been on the up-and-up after All-Star, winning 14 of their last 16 games as they surge into the playoffs. Carlos Delfino’s numbers have been climbing this month as well. After playing in Russia during 2008-09, I thought Delfino came back looking like a different player this season and indeed he’s made some great progress. 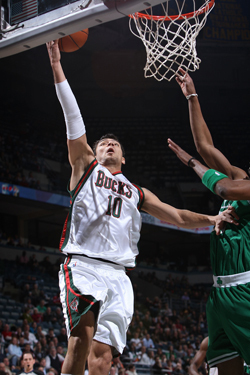 In his first year with Milwaukee, he’s shooting 41.1% from the field and averaging a NBA career high 10.8 ppg. In addition to grabbing five boards, the Argentinean native is good for a steal and a couple assists per game. Though Delfino was of action against the Clippers last week due to an ankle injury, he’s been going strong since his return to the court. Not only can Delfino put the ball on the floor and slash into the lane, but he’s a threat from the perimeter as well. He knocked down four 3-pointers en route to 21 total points and seven rebounds on Saturday night, bumping the Bucks to a 102-97 win over the Nuggets. Delfino has been a significant factor in his team’s success so far this season – I expect him to fight hard and finish strong down the home stretch too.